Landscape: The rocky shores of hopeless odor. …so you mean to say that this Kane fellow is completely anti-social and he will not even attend Kicky Village birthday picnics? This seems highly peculiar. Head Kicky: Indeed. That’s why it just doesn’t seem possible that he would open up to you like you say. He is a very strong Kicker, but has turned his back on Kicky society. PF: Perhaps… You know, that extensive expositional backstory for Kane, the lone stealth Kicky, has taken all night, and yet the Hydration Station still has not abated the horrific whale stink that capitalizes the atmosphere. Head Kicky: No. I fear his body fumes may defeat us. 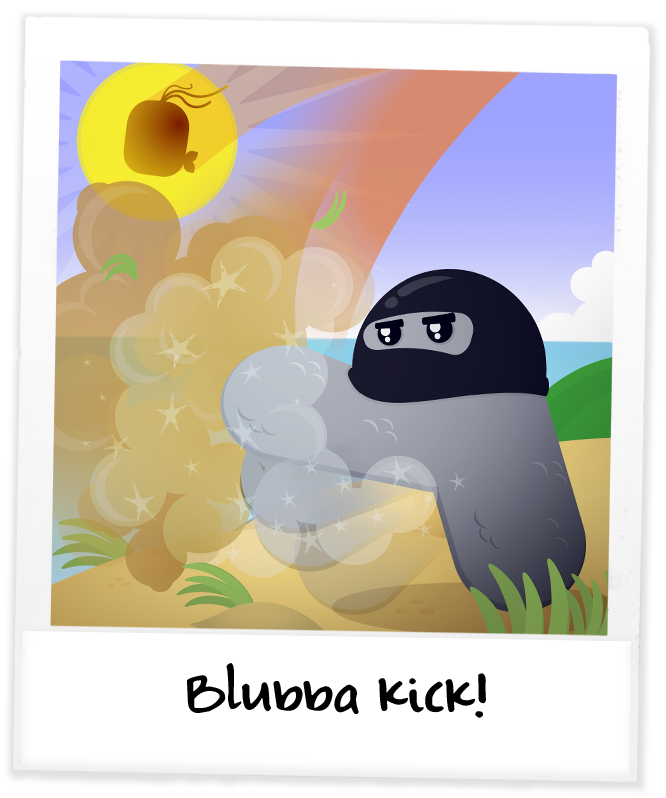 Big Kicky: Sir, I think Blubba’s poisonous secretions have run-off into the sea, putrefying that as well. And since the ocean is our source for the Hydration Station, we’re basically pumping him with an endless toxic marinade. Head Kicky: What’s going on? Kane: Kicky Siblings! I have overheard recently that you feel I have abandoned you! PF: How did he hear that? PF: I told you that rock was breathing and listening! Kane: I wish to prove to you that I am not a deserter! O great stink machine – prepare yourself! Blubba: Is he talking to m-OOOOOF!!! Blobby: Look at ‘im fly! PF: Kane, you saved the day! You Kicked that stench mound clear out to sea! Head Kicky: Why, you are the Kickiest Kicky who ever Kicked! Head Kicky: What took you so long? Kane: I thought that everyone hated me because I looked different and like to stalk the shadows, as my Ninja upbringing has me wont to do. Head Kicky: No no, we just thought you were a little different. Big Kicky: I want him for striker on my soccer team! Kickies: No, me! Me! I want to be his best friend! PF: Well well, looks like another story resolved thanks to the quick thinking of Professor Frederick Fliggins. PF: Horsepucky! I did so! Blobby: Not really. You just kinda walked around while stuff happened around you. PF: WHATEVER. Let us just hurry up and get the location of Professor Island finally. Mr. Blubba! Sir! Over here! Blubba: My bottom – it is made of bruise! PF: Yes, naturally. Anyway, are you prepared to get on with the story of you life you started nearly a month ago and tell us the location of Professor Island? Blubba: I’d be happy to, but I’ve lost my place. I shall start at the beginning! Kane: He shall not pollute our shores again until he swims off that smell. PF: Now we are stuck. Where is my home! Kane: Perhaps the Pants peoples of Pantsylvania know. Kane: Kickies obviously cannot wear pants for we are mostly legs and would not only suffocate, but also lost critical knee flexibility – HOWEVER in my many quests about this vast continent, the only place I encountered creatures who look anything like you are the Pants, particularly the plaid ones, in Pantsylvania. PF: Zounds! That could be a lead! Where is this place? Kane: Due west – clear across the entire world! PF: Right. Well, gang, you ready? Let us be off! Kane: Farewell, friend. May the winds carry you favorably to the zippered ones. PF: Thank you, friend. Congratulations on your reintroduction to society. Into the dirigible, little ones! 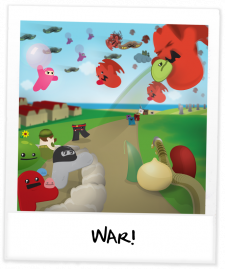 PF: Toodle-loo, Kickity Kickers! 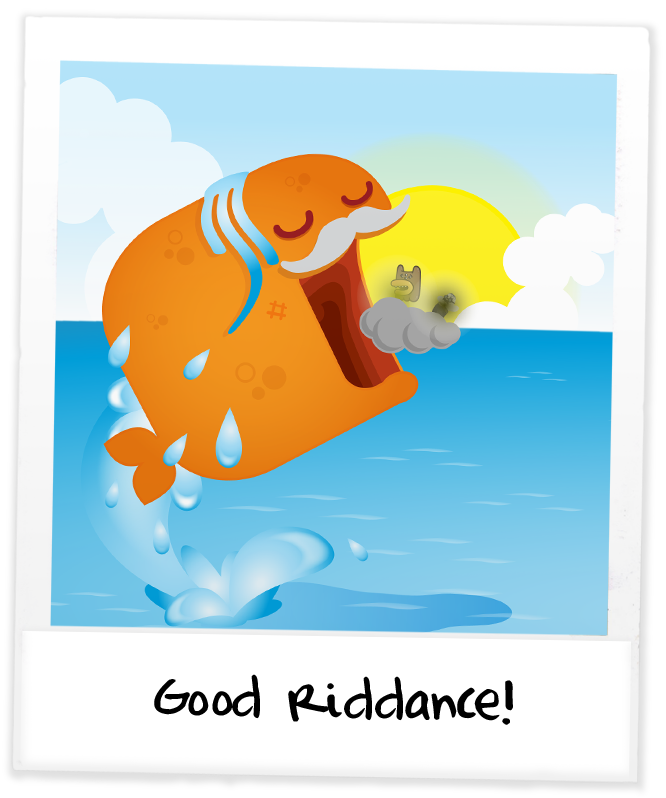 Bye bye, chatty smelly Blubba! See you later, this hemisphere of the world! I hope that I have left you better than when I entered you! 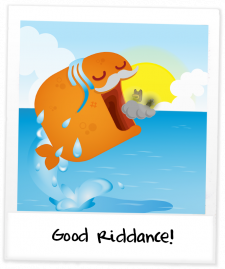 The Western Hemisphere of Shawnimaland: Goodbye, Professor Fliggins! Current Mood: To Pants! To Pants! Discoveries Made: The incredible Kicking power of Kane! Landscape: Rocky. Good for cross-training. PF: So as you can see, Mr. Kane sir, this mouthy monstrosity has collided with your shore and needs to somehow be returned to the sea. Kane: Why do you want to help it? Roy: And he knows where Professor Island is! PF: You do not know HOW to help, or if you WANT to help? Kane: Either. Both. I do not know. PF: Remarkable. Well perhaps you could – HEY, where did he go? PF: Oh, hello. I promise that I did not deal that smell… Nor am I accusing you, gaggle of armless chaps, that YOU have dealt that smell! How illogical is it that one who smelts shall also be the one who dealts. Deals. Um. Hello.
? : Hey. Seriously, what’s that smell? PF: Well, I do believe it is the giant orating beached whale that is currently baking in the sun behind me.
? : Good gracious! A beached whale! PF: Yes, that. That is whom dealt it. Kicky: C’mon, Kickies, let’s start dousing this thing with water so it doesn’t dehydrate. PF: So the denizens here are called Kickies. Note that, Blobby. Big Kicky: How are we gonna get this thing back in the ocean? He’s gigantic! Big Kicky: Ungh… He won’t budge! 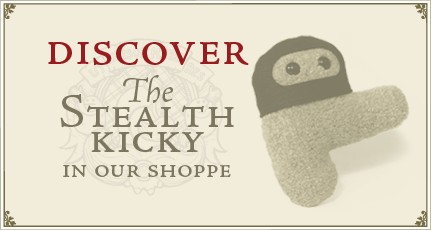 Discoveries Made: "Kickies" is the plural of "Kicky." I have Discovered plural Kicky. B R R R R E E e e e E E R R C H H H G H H!!! 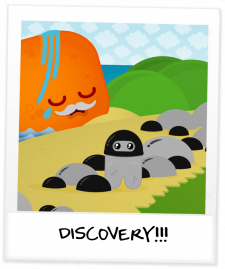 Blubba: Oh dear – I’m beached! PF: NO! He was just about to start his life! Blubba: And now I am about to start my death! Beached! Alas, I am beached! PF: Um. Well, so, surely, sir, SURELY we can help you eventually and in the interim, you can continue with your tale? 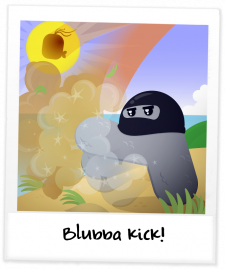 Blubba: Alas! I cannot! Beached! Like my poor Uncle Toby! PF: We shall hydrate you, you just need to get to the location of Professor Island! PF: Do not attempt to strangle this huge neckless beast with your tiny tired hands, Blobby. He is not worth it. PF: Yes. 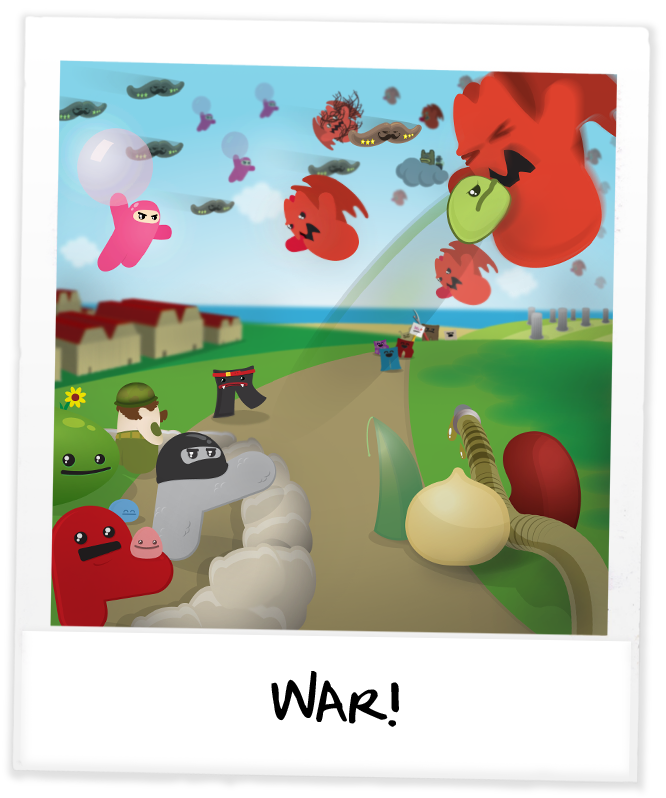 Let us away from Blubba, before Blobby explodes. Come friends, we walk to find help.
? : Help. Everyone needs help. PF: YES. Um, who are you? Can you help?
? : I do not know. Can I? PF: I do not know… Can you? PF: Yes. Yes you said that. Who..? Kane, the lone Stealth Kicky: My name is Kane. I am the lone Stealth Kicky. PF: I keep Discovering the oddest fellows… Well, MAY you PLEASE help us? 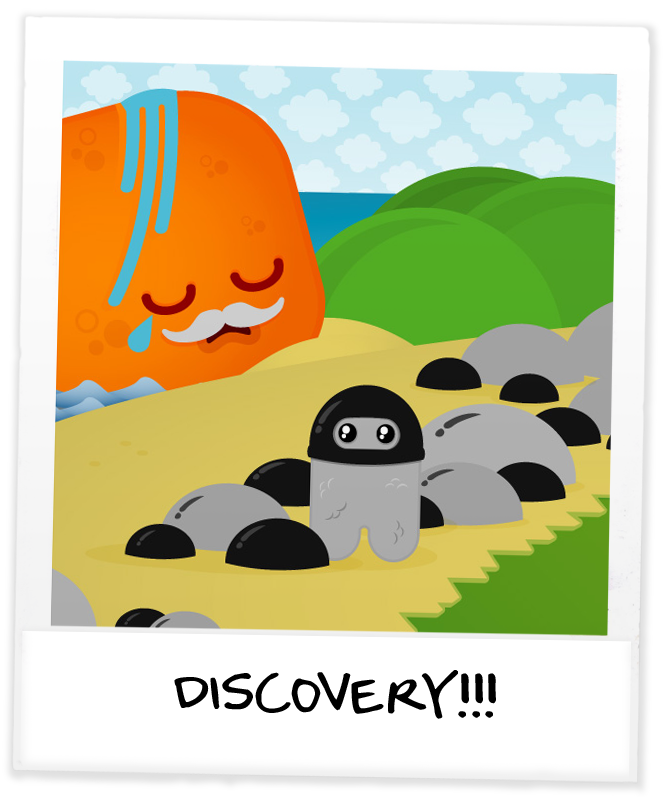 Discoveries Made: NOT PROFESSOR ISLAND.